This is my first post on herbs and spices. I will try to cover some of those plants which are used for flavoring dishes, have medicinal benefits or are grown as vegetable. Herbs. The term immediately reminds us of exotic plants used sparingly for their flavor and/ or medicinal qualities, to be grown with great care and patience if one is to have good results. True, herbs require shade and just enough moisture to flourish. They are very particular, I have still not succeeded in growing coriander; many gardeners will raise their eyebrows at this. However, one advantage that many herbs have over growing other types of plants is that mostly herbs do not require a very large space or container to grow, they are very happy in shallow containers kept on window sills or in a shaded balcony. 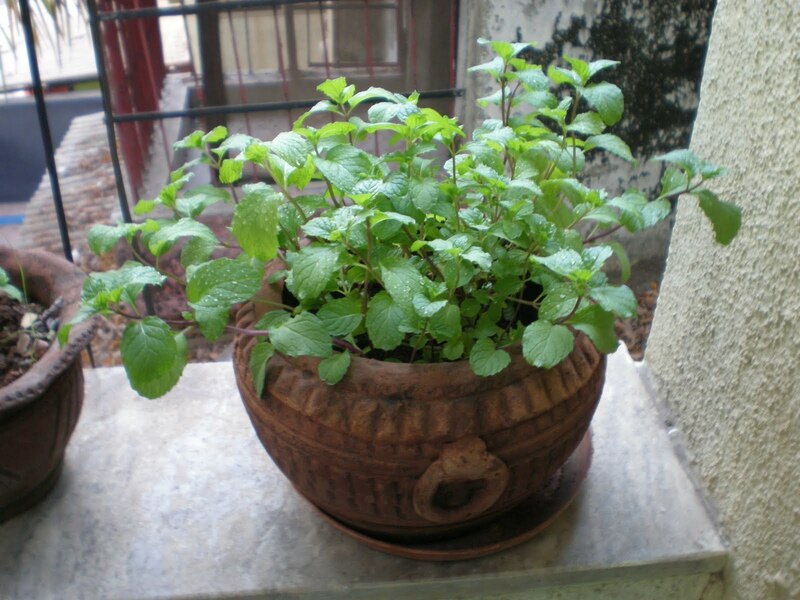 One of the simplest herbs to grow and which I always have in my garden is wild mint also called pudina in Hindi. Other names are field mint, corn mint or Japanese peppermint. 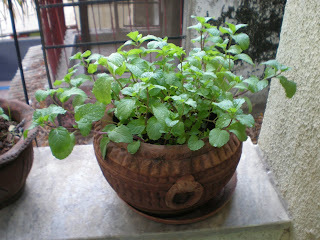 Pudina (Mentha arvensis) belongs to the genus Mentha of the family Lamiaceae. There are many types of mint. All are aromatic and they spread out over the ground. Mint if grown unchecked can spread over the ground and is considered invasive in many places. It can be grown from cuttings very easily. What I do is to strip the thickest stems of their leaves, and stick the shorn stems into a pot with soil and water lightly. The stem should have a few leaf nodes. Many times they have some root like structures also. After a few days distinct growth is seen. Do not allow the soil mixture to become very dry or soggy. Do not keep under harsh sun. Mulch lightly and keep harvesting for healthy and vigorous growth. For fertilizer I use NPK 1-1-1 or vermiwash. Pests which I have noticed are mostly leaf miners, else mint is relatively pest-free. Pudina is used in the Indian cuisine as chutney, in soups or as a garnish to add flavor and freshness to a preparation. Though pudina is used in very small quantities to be an effective source of nutrients, it does contain a good amount of calcium, phosphorous and iron as well as some vitamins. There are many medicinal qualities associated with pudina. It is used for curing digestive disorders, as a mouth freshner and in cough syrups. Remember 'pudin hara' which your mother used to give you for a tummy upset; it is still in the market and will be for generations to come. just my garden - chitra. Watermark theme. Powered by Blogger.